After the very successful TWP ft. Steve Aoki late last year, we had to bring back The White Party sooner than expected due to huge demand. 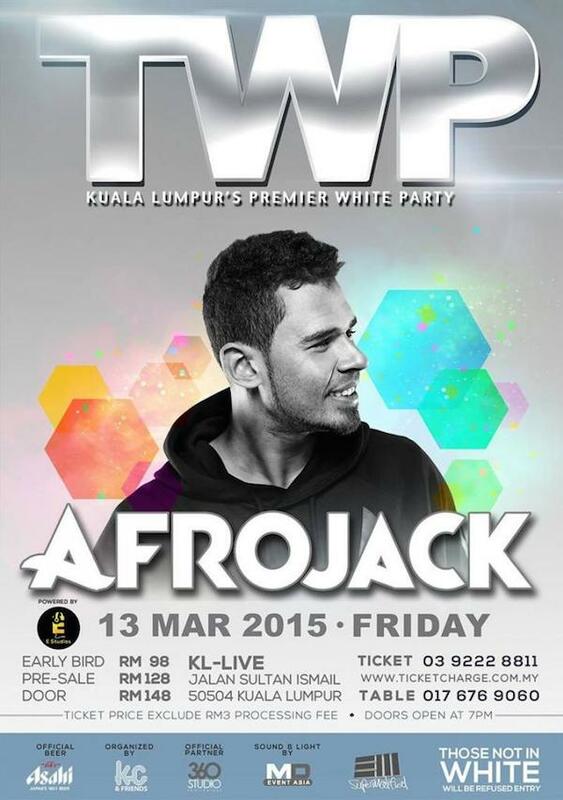 We had to go BIGGER & BETTER so we are happy to announce that this time AFROJACK himself will be headlining the party this March 13 @ KL Live. Expect a white party like no other as we change the atmosphere in KL Live into a -One Night Only- Milky yet Rich theme party with multiple surprises being thrown at you from all corners at any given time! Starting off in his hometown of Spijkenisse, Nick van de Wall aka Afrojack, quickly made a name for himself with a slew of hard­-hitting underground releases, before exploding on the music scene in 2011 with the release of ‘Take Over Control’ -­ an instant worldwide club and chart hit the single reached platinum status in the U.S. Afrojack then went onto develop his own imprint in the production world with his label ‘Wall Recordings’ – a platform by which other passionate EDM artists could grow. He also wanted his label to retain the ‘club music’ brand, something he strives for with every Afrojack release. 2011 also saw Afrojack sign a landmark deal to become one of the first ever DJ’s to sign an annual residency in Las Vegas, at the legendary Wynn Hotel. The residency saw Afrojack perform over a dozen times a year at Wynn clubs including Encore Beach Club, Surrender, Tryst and XS. From there the success continued; as well as making club hits and collaborating with the likes of David Guetta (co-writing and producing the worldwide smash ‘Titanium’), he also began to team up with and write for A­-list pop artists around the world, including Madonna and Chris Brown. In 2011, he co-wrote and produced ‘Give Me Everything’ for Pitbull and Ne-Yo, which to this day has sold more than 8 million copies worldwide and reached #1 in the US Billboard Hot 100 Charts. Not to mention his production work for Beyonce’s ‘Run the World (Girls),’ his Grammy nominated remix for Leona Lewis’ ‘Collide’ and his 2011 underground track ‘Rock The House,’ which topped the Beatport dance music charts after just three days. The same year he headlined both EDC (Electric Daisy Carnival) NY & Las Vegas to over 300,000 people, as well as UMF (Ultra Music Festival) in Miami, Tomorrowland (in Belgium) and Coachella (LA) in addition a colossal 40 city ‘Jacked’ tour of the United States, all packed into 2012.